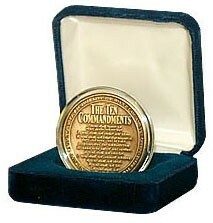 This coin has the Ten Commandments on one side, the gospel on the other and can be easily read from any angle. They make for an excellent springboard into the gospel and also a wonderful gift. (Each coin is 1.5 inches in diameter and has a bright gold color) -- Velvet case is not included. This coin has the Ten Commandments on one side, and the gospel on the other and can be easily read from any angle. They make for an excellent springboard into the gospel and also a wonderful gift. The front side presents the Ten Commandments. The scripture that runs around the outer edge of this side is James 2:10, "For whoever shall keep the whole Law, and yet offend in one point, he is guilty of all." The back side has a short and simple Gospel message. It reads, "You have to face a Holy God on Judgment Day. He sees lust as adultery (Matt. 5:28) and hatred as murder (1 John 3:15). Will you be guilty? Jesus took your punishment on the cross, and rose again defeating death, to save you from Hell. Repent (Luke 13:5) and trust in Him today." An evangelistic website where the unbeliever can learn more is clearly referenced toward the bottom of the gospel message -- needGod.com. And the scripture that runs around the outer edge of this side is John 3:16, "For God so loved the world that He gave His only begotten Son, that whoever believes in Him should not perish, but have everlasting life." Our church gives the aluminum coin like this gold one to people in our town for outreach. I like to buy these gold coins as gifts for those on the outreach team. Some of them keep the coin with them at all times as a reminder to share the Gospel. These coins are beautiful and a perfect gift. People are very happen when they receive them. They came inside a transparent protection box (as seen in the picture) that fits the coin perfectly. I like the silver coins so much, I ordered these to give to family at Christmas. They will be a great Christmas stocking gift - in fact, a great gift.